There are about 6-8 millions of Catholics living in Vietnam, making Vietnam home to the second biggest Catholic community in Southeast Asia. The churches are common sight in Vietnam. 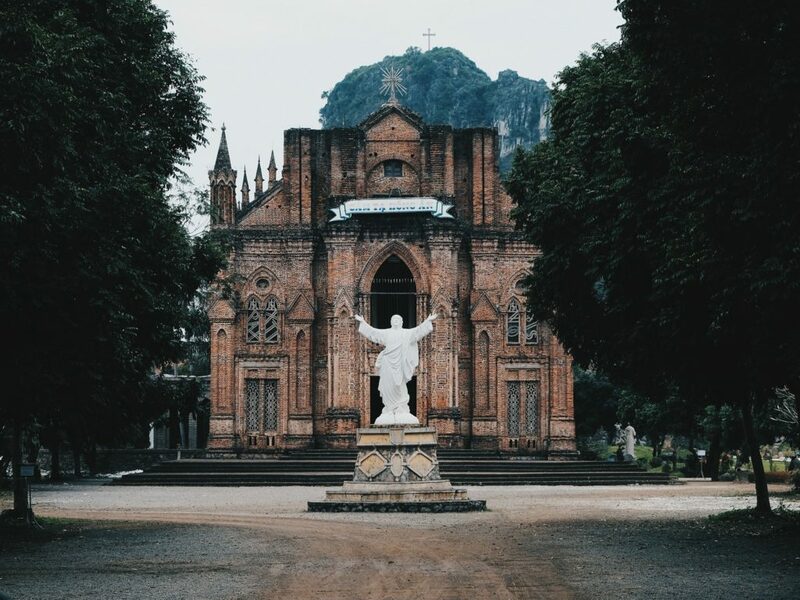 Not only important in the lives of Christianity believers, but also churches in Vietnam have also become a great opportunity for travelers worldwide to explore a different side of South-East Asia. Here are 10 best churches in Vietnam from north to south. 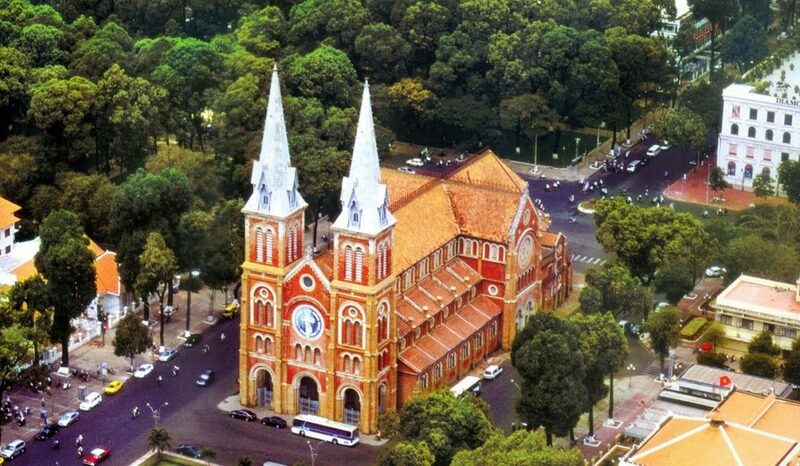 Built in 1886, St. Joseph’s Cathedral serves as the cathedral of the Roman Catholic Archdiocese of Hanoi for many Catholics in the country, and thus is commonly called “Hanoi’s Big Church”. The building in Gothic style is very popular place in Hanoi for photos taken and attracting visitors from everywhere, mainly because of its location, and also because it holds mass several times per day. 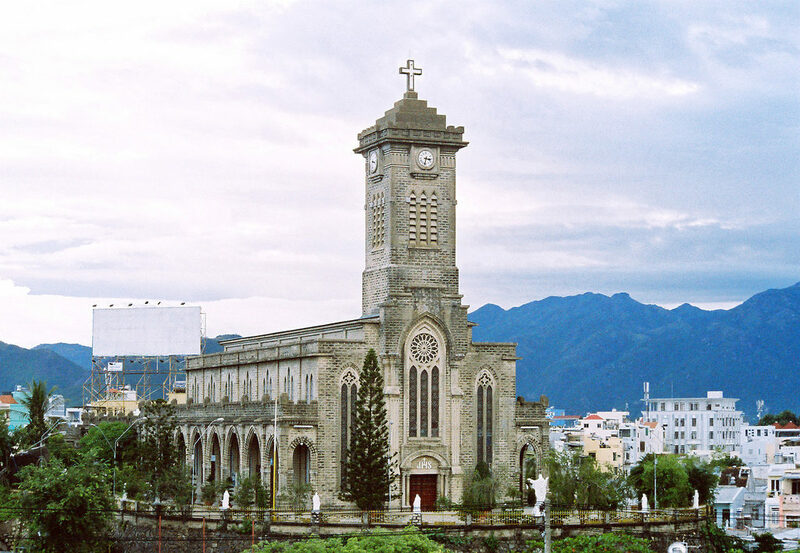 Sapa church, located right in the center of the town,is known as the Stone Church or the Holy Rosary Church, was built by French after a careful consideration of choosing the location as it’s an important spiritual meaning for Catholics. The church was built by stone under the cross by Roman Gothic architecture and decorated with lovely stained glass windows in a modern style that depict the life of Christ. It’s only open for Mass on Sunday and on certain evenings for prayers. A mixture of Vietnamese and European architecture, the Phat Diem Cathedral in Ninh Binh was carved in 1892 entirely out of natural stone. This serene Vietnamese church consists of the main cathedral, five small chapels, one bell house and three man-made caves. It is said that the preparation phase itself took 10 years, and the whole cathedral complex covering 22 hectares took 30 years in total to be built. The roof of the church is designed in form of a Buddhist pagoda, and its unique architectural style attracts domestic and international tourists from all over. Built in 1939, Chau Son is a monastic church, originally from the Phuoc Son Monastery (Monastery of Phuoc Son founded by Father Henri-Denis in 1918). Chau Son Monastery is located in a quiet mountain forest. 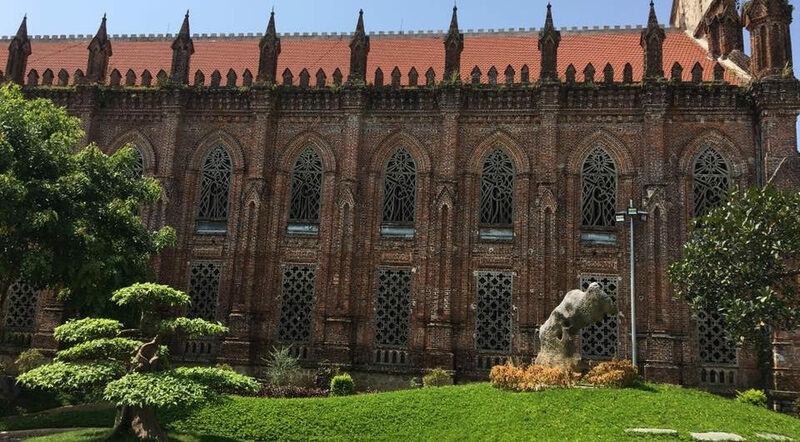 What is special about the Chau Son Cathedral is that it is designed in the style of Gothic architecture with the main material is a red brick so this is a unique beauty is unique in the north. The walls are about 0.6 m thick, with columns 1.2 m thick that create warmth in winter and cool in summer. Seen from the sides, the special feature is that the columns are designed into symmetrical towers. The walls are decorated harmoniously by the windows divided into two parts; the interior is the wooden glass door, the exterior is the picture carved the image of the saints, the person carrying the cross and prayer. 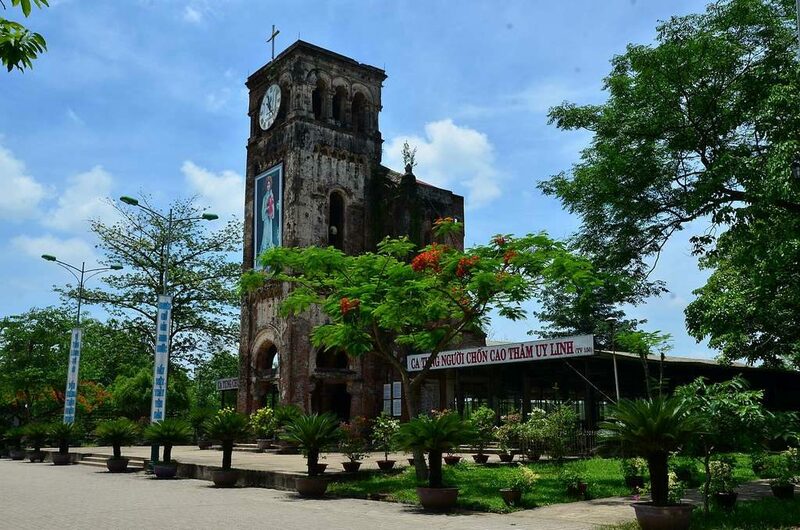 The Church, also known as Basilica of Our Lady of La Vang, refers to a reported Marian apparition at a time when Catholics were persecuted and killed in Vietnam. La Vang is situated in what is today Hai Phu commune in Hai Lang District of Quang Trị Province in Central Vietnam. 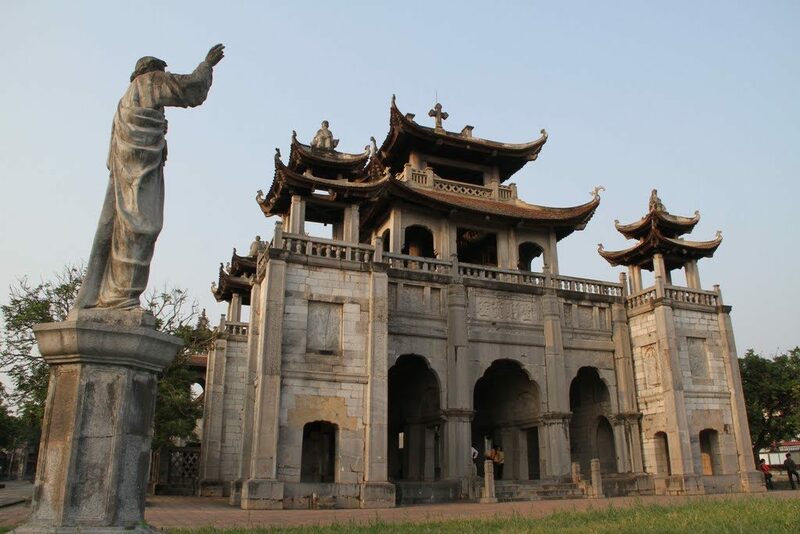 Situated at Phuoc Vinh, Hue City, the Cathedral was built with modern architecture, designed by the architect Ngo Viet Duc. Construction started on the property in 1963 with further additions in 2000. Phu Cam cathedral was built by new concept of physical structure. Supporting pillars were concreted closely attached to the walls and gradually bent ahead. The three supporting pillars at each of four corners stretch out and create a fairly large space to embrace the whole of Saint Palace and Saint Altar. The interior of the Cathedral was built following classical Roman Catholic tradition. 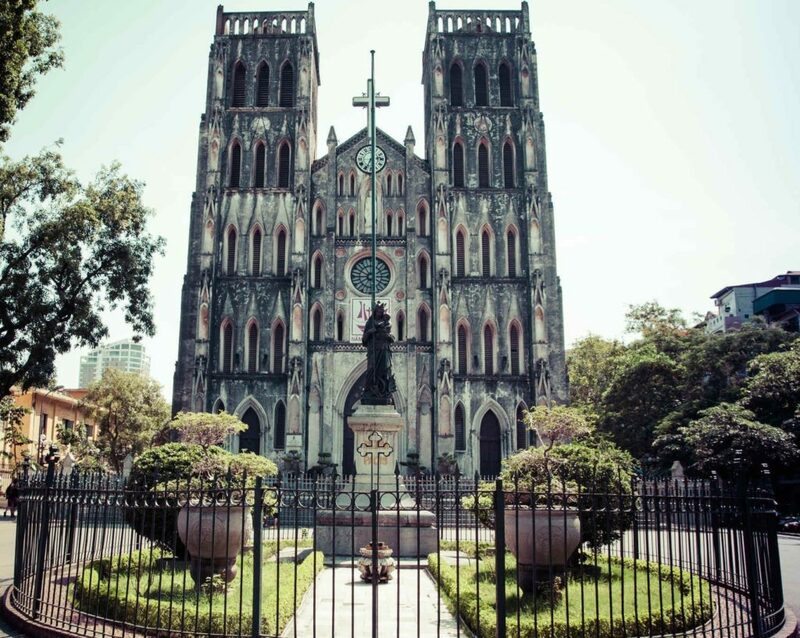 Built in 1923 for Danang’s French colonial population, the cathedral is an easy half kilometer walk from the City. The cathedral is also known as Rooster Church, which comes from the rooster that sits atop the impressive steeple. The church officially opened its doors on 10 March 1924 with the purpose of serving the French Catholics who lived in Danang at that time. Now, the cathedral still functions as a lively place of worship. Commonly known as the Mountain Cathedral, the Church of Christ the King is located in the upper part of coastal Nha Trang. 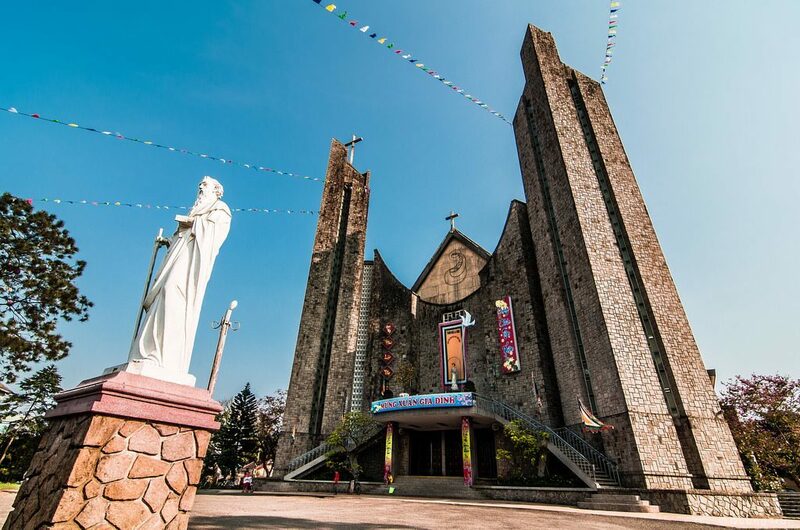 Built using bricks made from cement and gravel, this Vietnamese church is commonly mistaken for a stone church. As stunning the exterior looks, the interior of the church is ten times more marvelous with rose doors and incredibly beautiful stained glass windows. 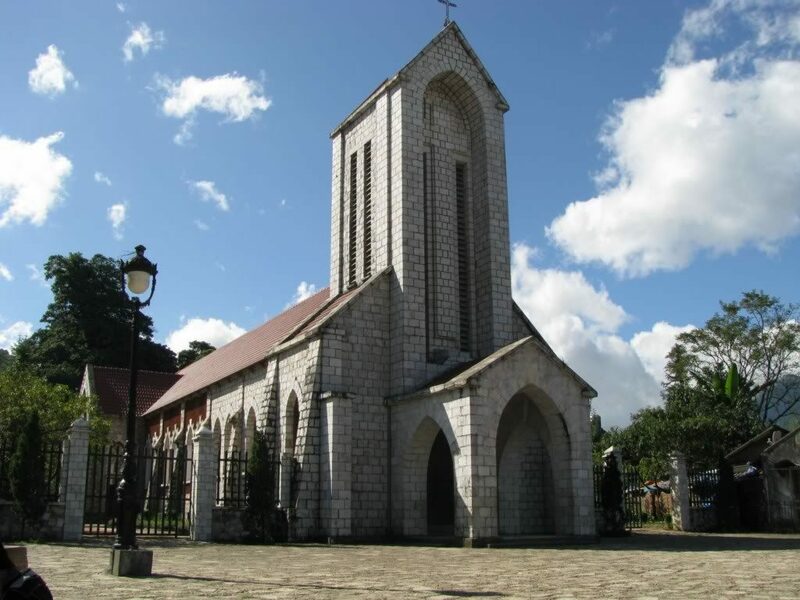 The gothic style architecture with a 28 meter tall bell tower, the Mountain church was built between the years 1928 and 1941. 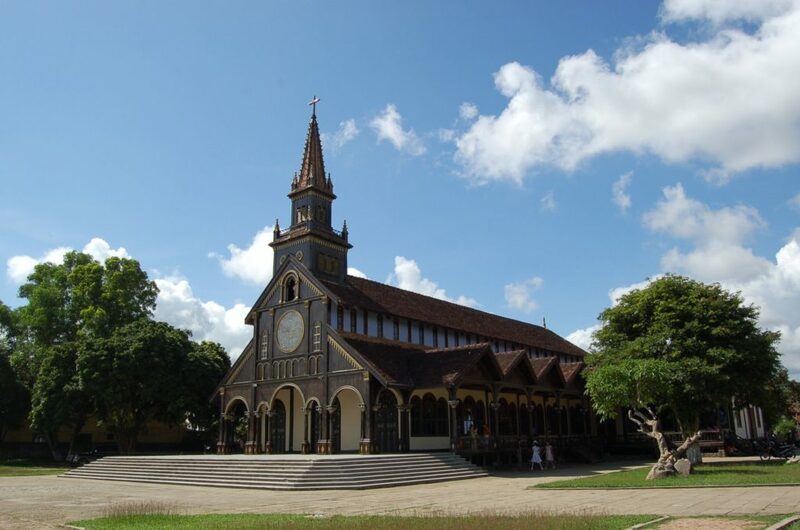 Kon Tum church is considered to be the biggest wooden church in all of Vietnam. This century old cathedral’s architecture is a combination of Romanesque European style on the outside, mixed with the Vietnamese central highlands style used for the inside decoration. The church has a front elevated floor which is one meter higher than the surrounding corridor, representing the Ba Na tribe’s traditional stilt houses. The entire complex includes the main church, exhibition center, communal houses, orphanage and workshop space. One of the most popular churches of Vietnam, the Notre-Dame Basilica of Ho Chi Minh City has a unique stunning architecture with every brick imported from Marseilles, France. It has an ancient exterior appearance, and a calm and peaceful interior where mass is held on every Sunday. 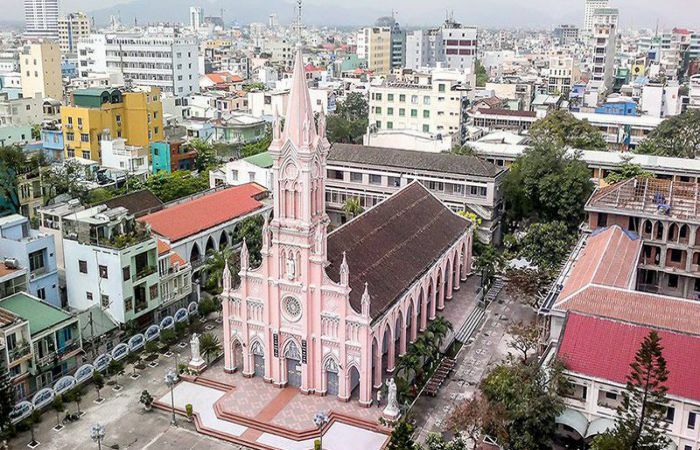 This huge structure is standing in the center of Vietnam’s busiest city, therefore, you’ll see many tourists flocking here to capture the church in all its glory. The church is undergoing renovation and will not be open to tourists till 2019. For further information on Churches in Vietnam or need any tailored made Vietnam Catholic Pilgrimage Tours please email us now at sales@vietholidaytravel.com and info@vietholidaytravel.com or see another Vietnam tours and holiday packages.